There is nothing better than a horrible photoshop job....so there. As an old friend said recently, "Two out of three aint bad" an unexpected and pleasantly optimistic viewpoint of the Blueshirts recent roadtrip as the New York Rangers dropped a bomb in Tampa, followed by a perfect shutout of the Florida Panthers and ended with a hard-earned shootout win against the Nashville Predators. Official recap vs Nashville here. Brandon Dubinsky once again demonstrated his all-around game - though not on the boards against Nashville, he is showing signs of a leader on the team and his stats are proving just that; the all around efforts by him and Ryan Callahan are getting the attention of the league and we're beginning to see opposing teams double covering Dubie, 'as if' he were some Marian Gaborik or something.... Oh, and did I mention that Gaborik didn't play on Saturday night either? Again? This time out with flu-like symptoms, our core team of Dubie, Callahan, Fedotenko, Prust, Sauer, Girardi, Staal, Boyle and Sean Avery are defining this team with a hard working ethic that is mostly winning games. Henrik Lundqvist in goal the last two games had a strong showing - a blanking against Florida and a terrific shutout whitewash against Nashville, but let us not forget Marty Biron, who is becoming as important as anyone on this "Black & Blue" squad - one that never gives up despite the score and generally manages to deliver a solid effort. If Henrik can adapt to a two-way goalie system, then we're better for it. 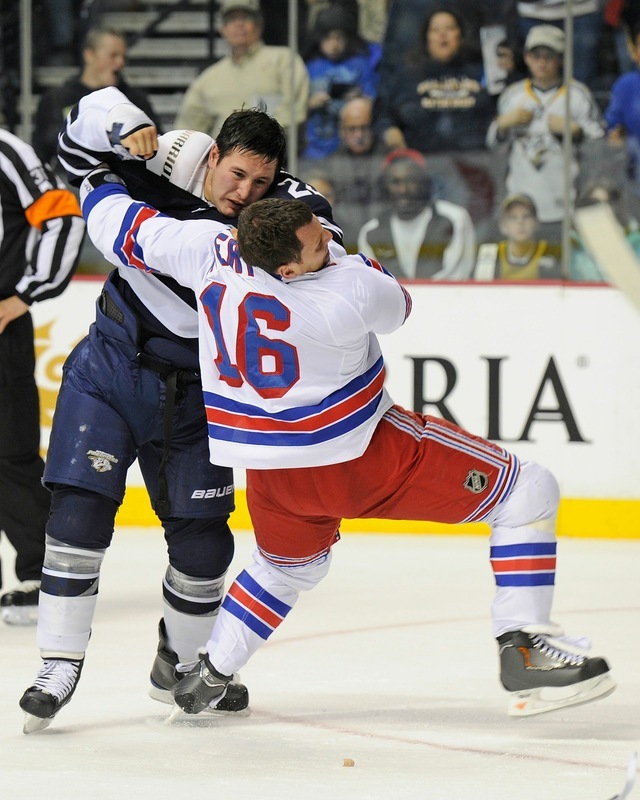 Sticking up for a foul Christensen hit, Sean Avery stepped up and had his head handed to him by Nashville's Tootoo. Michal Rozsival played a damn good game. How's that? After coming off a nine-game absence, he was surpringly in line with the system and played hard as if it were a playoff game. So there. I'm still Rozzy-agnostic, though, so don't celebrate too hard, but credit is due to a solid performance. So with six minutes in the third period left on the boards, Ryan Callahan scored to tie-up the game, which led to overtime, which led to the shootout. Erik Christensen was the first player called to take part in the shootout, and he beat Pekka Rinne with an aggressive move before slipping the puck just inside the left post. It turned out to be the game winning goal as Henrik Lundqvist did the rest by denying three subsequent Predator attempts. Amen. It was a well deserved win that kept this young and rookie team in the sixth slot in the Eastern Conference with a 14-10-1 record, 3rd in the Atlantic Division behind Philadelphia and Pittsburgh. I'd say we have a damn good team, not great. But they're getting better. 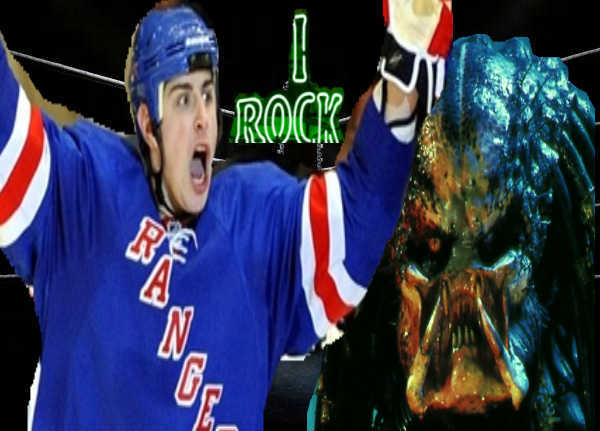 Tonight we host the Penguins (15-8-2) at MSG and, dammit, I look toward another win against this franchise --- it's always fun to see Sid the Kid Crosby banging his stick on the ice, hitting the post in frustration and losing --- each of the Rangers last three games vs. the Penguins have gone into overtime, dating back to a 3-2 win on Feb. 12, 2010 at Pittsburgh. The Blueshirts are 2-1-0 over the span, so luck will be on our side tonight.